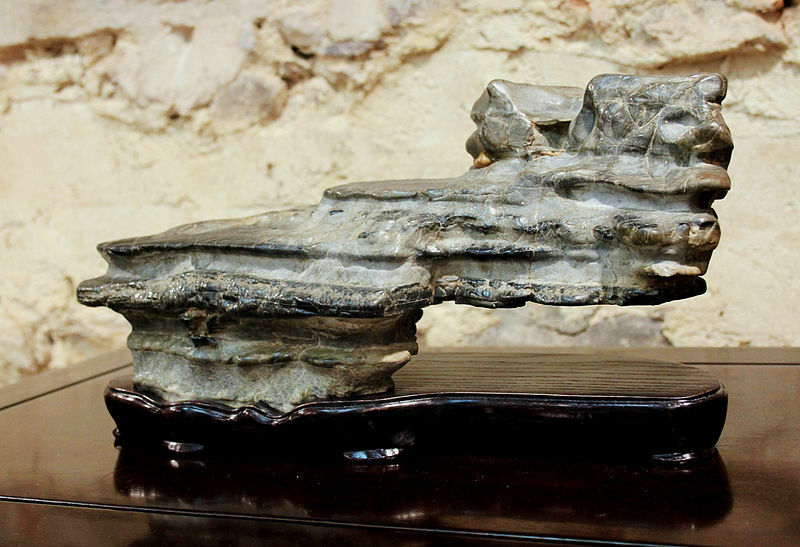 A viewing stone said to resemble the famous monk Bodhidharma (often associated with the Shaolin Temple). 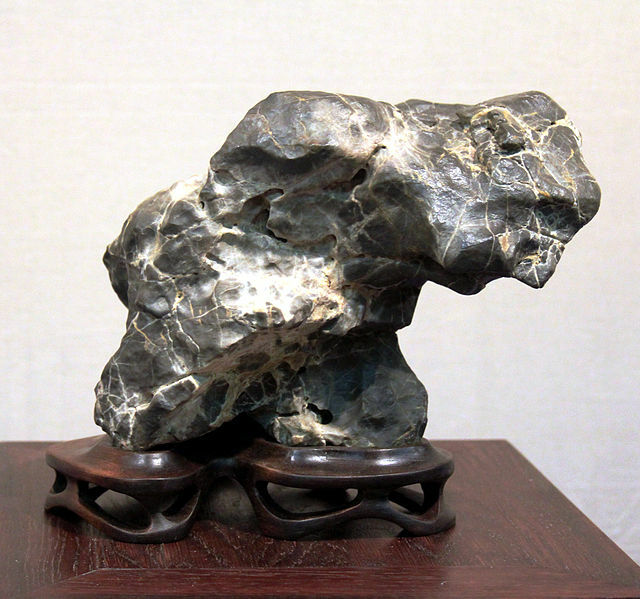 Stones like this are collected and appreciated by individuals in both China and Japan. 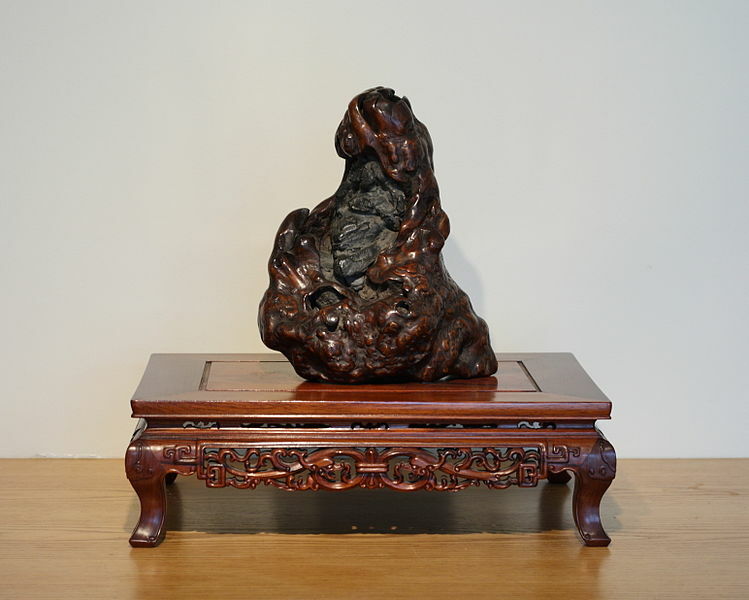 This particular specimen is located in the National Bonsai and Penjing Museum in Washington D.C. Source: Photo by Sage Ross, Wikimedia. This post will be reaching most of Kung Fu Tea’s readers the day after many Americans celebrated Thanksgiving. On this particular holiday it is customary to spend a few moments contemplating those things that one has reason to be grateful for. As I was going back and reviewing a few articles earlier this week it occurred to me that I should be grateful for Adam Frank, and his various writings on the Chinese martial arts. I have spent much of the year putting the finishing touches on a large project of my own (one that is now pretty far along in the production process, but to which the publisher has yet to announce a formal release date). When I was first considering a book on Chinese martial studies I wondered whether there was really the depth of theoretical thought (or academic interest) to support such a project. A variety of people had been working on different aspects of this puzzle (Meir Shahar, Douglas Wile, Stanley Henning….) but it was only after reading Taijiquan and the Search for the Little Old Chinese Man that I decided that this was a research area that was going to emerge as a field of its own. This book influenced my own writing and thinking on the topic in number of ways. While Frank’s monograph can be a little hard to track down if one does not have access to a decent university library, any reader can download a free copy of his more recent article “Unstructuring Structure and Communicating Secrets inside/outside a Chinese Martial Arts Association” published in the fifth volume of the JOMEC Journal (Spring 2014). Earlier this year I had a chance to review a couple of the papers published in this special edition on Martial Arts Studies. Yet as sometimes happens, I was distracted by other projects before finishing the task at hand. This is a shame as Frank’s contribution to the special edition of the JOMEC Journal provides readers with a lot to think about. His piece begins with a scenario that anyone who has spent much time around the traditional martial arts will likely find all too familiar. One of his Wu style Taijiquan instructors, whom he calls “Teacher Zhang,” has come to America to visit some of his students and present a series of workshops. Unfortunately this is not an altogether happy reunion. After teaching a set of “secret family exercises” to a group of European students, Teacher Zhang has been ostracized (and basically excommunicated from) his master’s martial arts lineage. While other prominent teachers in the group had also taught the exact same exercises to their own foreign students, in his case such activities were framed as simply beyond the pale. In the view of other senior members of the organization it was unacceptable to teach “family secrets” to foreign students. This dispute put Teacher Zhang in a very emotionally challenging position as the social structure that he had invested so much of his identity within over the course of his entire adult life had effectively turned its back on him. Unfortunately conflicts within hand combat associations are rather common in the world of the Chinese martial arts. This somewhat fractious social structure has actually been commented on by various reformers attempting to promote a greater sense of unity since the first decades of the twentieth century. While such disputes are personally painful, to a trained ethnographer they have the potential to open valuable windows onto the personal histories, cultural values and social structures of the organizations that they occur within. While considering the case of Teacher Zhang, Frank noted something very interesting. Both of the aggrieved parties in this dispute claimed that the conflict happened because someone had ignored or ruptured the various unspoken social expectations that collectively comprised the social structure of this specific martial clan. The senior disciples noted that Zhang had violated a (previously fuzzy) agreement not to teach certain exercises to foreign students, betraying the memory of China’s humiliating experience with western colonization. Zhang noted that this was not how things had been done in previous decades. Instead it was the progressive corruption of the organization through greed and competition for lucrative foreign teaching jobs that ultimately led to his undoing. Anthropology has a rich tradition of theorizing about social structures. Yet as Frank notes, at the moment such approaches are often seen as somewhat problematic. The dispute between Zhang and his previous colleagues provided Frank with a timely opportunity to reconsider the wisdom of this disciplinary judgment. Another viewing stone. Source: Wikimedia. Ultimately Frank decided that any single variable reading of a lineage dispute will probably obscure as much as it reveals about what is really happening. This also implies that any simplistic model of the function of martial arts associations at other times is also likely to have the same shortcomings. To better grasp the issues he proposes that students of martial arts studies adopt an interdisciplinary and dialectic approach by simultaneously considering a number of different theoretical approaches. More specifically, over the course of his essay Frank takes three cuts at the origins and significance of Zhang’s problem. The first of these focuses on what might be considered the more “materialist” variables. Frank begins by looking at the ongoing legacies of imperialism and how they have impacted the Taijiquan community. He then follows this up with a discussion of the reemergence of the art after the Cultural Revolution, and the economic frictions caused by the integration of relatively wealthy western students into various preexisting local schools and associations. The second explanation of Zhang’s problem focuses instead on cultural factors. It needs to be stated at the outset that it is impossible to draw bright lines between cultural, material and social factors. Bringing these various approaches together into the same research project is fruitful precisely because at the margins all three of these categories tend to bleed into (and influence) one another. After reviewing a few elements of the popular discourse on Kung Fu and “martial virtue” in film, Frank concluded that these messages (or various aspects of them) were likely internalized by both Zhang and his foreign students. One overriding theme of this cultural discourse was clear. In these stories the martial arts are a realm of carefully guarded esoteric secrets. The status of a student is linked to his or her ability to collect these secrets, and the value of a teacher stems from their ability to provide instruction in them. While both Eastern and Western students consume many of the same stories and movies, Frank did notice a few important differences in how these messages were internalized. Zhang’s European students tended to view the value of his “secret exercises” as pertaining to a deeper understanding of Chinese cosmology, health and spirituality. Zhang, on the other hand, was dedicated to the more practical aspects of the art. For him the great secret was in the achievement of actual martial prowess through a very specific set of exercises. Still, at the end of the day Frank believes that the messaging within the media drive martial arts discourse predisposed foreign students to press for certain kinds of teachings, and Zhang to acquiesce in ways that he might not have if everyone had been standing in a public park in Shanghai. Lastly there is the question of social structures. On the one hand I don’t think that anyone doubts that social structures exist and that they condition certain aspects of our behavior. None of us choose our names, our language or (truth be told) even our political affiliations. We are born into families that we did not create, we acquire languages that we did not invent and the single best predictor of someone’s political sympathies is the party affiliation of their parents. But how far does this sort of social determinism really go? At what point (if any) can we view individuals as pursuing their own self-interest and reacting rationally (even strategically) to events around them? In the case of Teacher Zhang this more general question comes into sharp relief. Is it really the case that this lineage dispute erupted because one or both parties brazenly ignored core aspects of the social contract that constituted their relationship? Was it some fuzziness in the nature of the original social structure (perhaps something aggravated by the sudden explosion of foreign students and teaching opportunities after 1990) that led to the rupture which Frank observed? Again, both parties told stories about the dispute that shifted agency onto the structure itself. Or is there something else going on here? Rather than simply accepting social structures within the martial arts as given and unchanging, should we instead understand them as a field on which various disagreements and disputes are played out? Put another way, does “tradition” rigidly define the horizons of activity in the martial arts? Or do various actors basically respond rationally to the confusing (and often quickly moving) events around them. For a variety of reasons they then attempt to explain their essentially strategic actions within the categories of social meaning provided by these shared structures. As is typical of his writing, Frank provides the readers with no easy answers. We do not hear the ultimate resolution of Teacher Zhang’s case. And the logic of each of the three approaches outlined by Franks is sufficient to explain the few aspects of the dispute which he discussed in his case study. Still, the implication of Frank’s argument is clear. While one can conceptualize a given case three different ways, a more synthetic approach might have real benefits. Yet the central issue, the point that one should take away from this paper, keeps coming back to the essential nature of social structures. In some ways the traditional martial arts are little more than complex interlocking webs of social organizations, institutions and structures. That’s probably why these groups are such attractive research subjects for both sociologists and anthropologists. And when Frank and other ethnographers look at disputes within martial arts communities, one of the things that quickly becomes clear is that the supposedly timeless and unchangeable structures of these communities actually show a surprising degree of flexibility. In fact, they can change so quickly that they leave individuals like Zhang scratching their heads. Why? The answer might ultimately be found in the material (specifically financial) and cultural lines of argument that he introduces earlier in his paper. Rather than tightly constraining innovation, competition over how these structures should be imagined actually becomes an engine for change within the Chinese martial arts. Certain changes in either material or cultural factors may lead to rupture in some places, and the creation of entirely new aspects of structure in others. Does this then mean that structure is entirely epiphenomenal? Are we free to ignore it, and adopt a more realist or culturally informed approached? Are social structures nothing more than the inevitable synthesis between “thesis” and “antithesis?” Again, Frank gives the reader no direct answers. I think that it is unlikely that Frank would totally dismiss the utility of structure as an explanatory variable. If nothing else, it is very interesting the degree to which it monopolized the self-identity of both sets of actors in this lineage dispute. While we may be free to create our institutions, I doubt that any of us can create them just as we please. As the political science literature makes clear, there are limits to scope of rational reaction. Individuals almost always lack the time and resources to fully consider all of their options in most situations. Social structures inherited from the past often provide a simplified guide to understanding one’s own interests and priorities. When thinking about the nature of political structures neo-liberal theorists like Keohane and Nye have argued that even institutions rationally created to address a specific set of concerns can outlive their immediate environment. The fact that any type of social structure is costly to create means that individuals are loath to discard them needlessly, and will often try to refashion or renegotiate them first. Such a process is by definition a piece-meal affair and the end result (at least in the political realm) is that even highly motivated and strategic actors often discover that their field of maneuver is constrained by prior structures. This sort of “institutional drag” (as Keohane referred to it) can have an important impact on political outcomes. One suspects that much the same thing should be observable with other sorts of social structures as well. Note that neither Zhang nor his critics wanted to discard the old institutions. Instead they wished to renegotiate their meaning. Frank’s review of the theoretical debate surrounding the death of Captain Cook in Hawaii touched on a number of these points. However, readers who are not anthropologists (and already familiar with the debate that he references) may have benefited from a more explicit review of the arguments. While the initial review of the historical approach was well done, I wish that Frank had gone into greater depth in his discussion of the cultural factors (particularly film) which complicated this particular situation. While the general thrust of his argument is certainly reasonable, I would have liked a more detailed discussion of the mechanism by which this media driven discourse was actually affecting the identity formation process of his specific subjects. Nevertheless, these are minor concerns in comparison to the insights that are offered. The real value of this paper lays in its great portability. It is interesting to note that Frank’s discussion of the fungability of social structure within a lineage dispute largely agrees with the prior findings of Jeffery Takas as outlined in his article “A Case of Contagious Legitimacy: Kinship, Ritual and Manipulation in Chinese Martial Arts Societies” (Modern Asian Studies 37:4 885-917). When looking at the construction of artificial lineage networks within martial arts societies, Takas also discovered that far from being a reflection of some static and unchanging history, such identities were actually an important vehicle for change and competition within the martial arts community. Frank’s article demonstrates that this same basic logic applies to a much wide number of social structures within the martial arts, and Chinese society as a whole. This is an approach that may have general applicability when looking at a wide number of problems. Much of Frank’s specific discussion in this paper revolves around the function of secrecy within martial arts clans. Yet there are many ways in which such disputes can play themselves out. One of the more curious aspects of Ip Man’s image as a Kung Fu master is his relationship with both modernity and the western colonial powers. Ip Man left few written statements of his own thoughts on these matters. Unsurprisingly those in his lineage have stepped in to interpret his image on these now critical matters. Yet one suspects that the very idea of secrecy is so deeply embedded within the cultural discourse surrounding the martial arts that there is a certain pressure to draw it into being. In purely economic terms, there might be a lot to be gained from claiming to be Ip Man’s “secret disciple.” Discussions of the passing and withholding of secrets within Wing Chun might also have served a valuable role within Hong Kong in the 1980s and 1990s. By moving the art towards the mainstream of Kung Fu culture it may have served to reinforce the essentially “Chinese” nature of the exercise at a time when huge numbers of foreign students were taking up the practice. It is interesting to clarify who was really being excluded by these secrets. One of the most often heard lines about Ip Man is that he refused to teach his art to foreigners. This may very well be true. I was not in Hong Kong in the 1950s so I cannot say with certainty what he thought about the idea of western students. Still, we may wish to consider where exactly these statements come from. The earliest verifiable recordings of this idea that I can find date to the period of the “Kung Fu Craze,” when Wing Chun’s popularity was rapidly increasing. Nor was Ip Man alive to offer his own thoughts on the question at that point. Of course the general problem with these statements is the fallacy of attempting to extrapolate someone’s motivations from their actions. One can simply observe that Ip Man had no foreign students when he was actively involved in teaching during the 1950s and 1960s. That is an easily verifiable fact. Yet how many western students were knocking on his door asking to be taught in the 1950s? So far as I can tell, only one western individual actually considered the issue. Clausnitzer interviewed Ip Man and wanted to start training in Wing Chun. Yet by his own account the limiting factor here was actually his mother’s suspicion that her teenage son was going to fall in with a bad crowd, not any immediate refusal on Ip Man’s part. At this point it is probably impossible to reconstruct what Ip Man actually thought about the possibility of teaching Clausnitzer. Still, it is clear that by the early 1980s much of the discussion of Wing Chun being a modern fighting system had been replaced with images of an entirely traditionally kung fu clan. How can we go about explaining this? Frank suggests both a set of basic tools and a roadmap for addressing such questions. One might start by reconstructing the specifically historical and economic forces that were at play within the Wing Chun clan from the 1960s-1980s. While certain individuals had sought to teach the system from the mid-1950s onward, the sudden eruption of Bruce Lee had a tremendous impact on the economic value of the Wing Chun community. Next one might want to consider the media discourse that Wing Chun students in both the East and West were consuming. In what ways did the classic Kung Fu films of the 1970s prime western students to demand a more “traditional” cultural experience? During these years did Wing Chun come to be less about effective boxing and instead physically experiencing Chinese culture? Likewise, how did the novels of Jin Yong shape the ways in which Chinese students understood the nature of their martial practice and its relationship with larger trends in Chinese popular culture? Lastly there is the question of social structure. As one reads through some of the literature produced in the period there appears to be a pretty obvious rupture. Even Bruce Lee is not immune. While he always claimed to be Ip Man’s student, stories began to circulate that he was asked to leave his teacher’s school (or was made unwelcome by the senior students) because of his mixed German heritage. Even the young Bruce Lee was not really Chinese enough for Wing Chun. Again, a definitive answer to these questions lies beyond the scope of this post. Frank’s essay is interesting as the methodological triangulation that he proposes may allow us to gain traction on this problem. Nor is the utility of this approach limited to the current era. While particularly useful in dealing with the complications of globalization, the general principles that Frank outlines may also be helpful in thinking about older cases. For instance, did Cheung Lai Chuen (an ethnic Hakka teacher and the inventor of White Eyebrow) really limit the teaching of his secret techniques to daughter schools led by fellow Hakka instructors? Given the centrality of lineage disputes to a wide variety of discussions within Chinese martial studies, Frank’s paper is sure to make a valuable addition to any student’s toolkit. 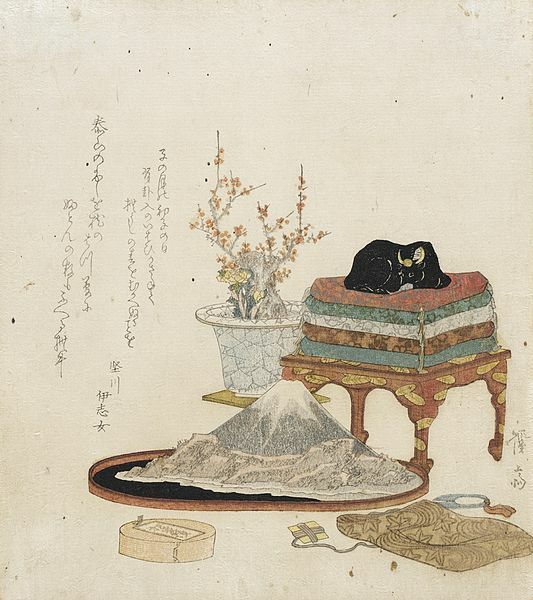 A Japanese painting showing how a viewing stone might be appreciated in conjunction with other art objects including a flowing bonsai. Source: Wikimedia.